It’s been a while since I posted a recipe. These darling little cupcakes were made for a special occasion a while back. I made them as a thank-you to everyone I worked with during my Internship. I have no sugar or all purpose flour at my place so you already know these cupcakes were gonna be healthier than usual. I revamped my basic vegan chocolate cupcakes recipe (that I used for the Snickers Cupcakes) and made them even healthier by omitting the use of processed flours and sugar! Yay for healthier choices in desserts! Then I played around with the frosting. I knew I wanted to use the color red… at least a little bit. The agency’s colors are red and white, and I wanted at least the frosting to reflect the spirit of the agency. I chose cherries. I was going to use strawberries at first but they all looked pretty old at the grocery store. That’s probably why they were on sale. Cherries were kinda cheaper than usual, although still pricy, but since I love cherries that much more than store-bought strawberries, I went for those! Everyone at the office loved these and every person that tried them complimented me on how pretty they were AND how yummy they were! 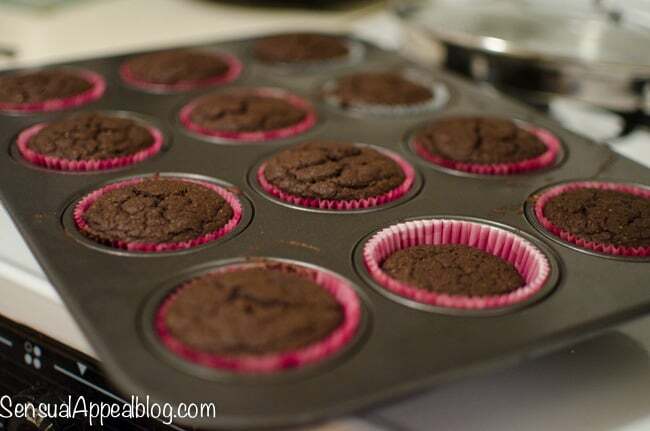 The cupcakes’ cake part is vegan and a bit grainy and easily separates from the wrapper even without spraying them before baking. 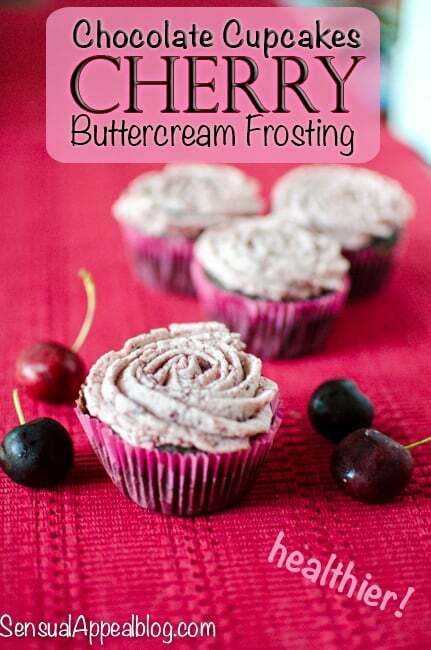 Since the cupcake base is not that sweet, it balances out beautifully with the sweetness of the traditional Cherry Buttercream frosting. Deliciousness in balance! Add apple cider vinegar to the milk, whisk and let sit. In a separate bowl, add flours, cocoa, and baking powder and combine. In the bowl with milk, add oil, vanilla, stevia and erythritol and whisk until combined well. If you can get it to be a bit foamy that’s perfect. If not, don’t stress. It will still be fine. Add the flour mixture to the milk mixture in 3-4 increments, mixing as you do it. Don’t overmix it. Add oat bran to the mixed batter and mix again until combined. Bake at 350F for 20-25 minutes, or until the toothpick inserted comes out clean. Cut the cherries into halves and blend using an immersion blender until smooth. In a separate bowl, using a handheld mixer, beat the butter until creamy. Add the smashed cherries and beat to combine. Add powdered sugar incrementally by ¼ cupfuls until you’ve reached the desired consistency. Do you prefer berries or cherries? 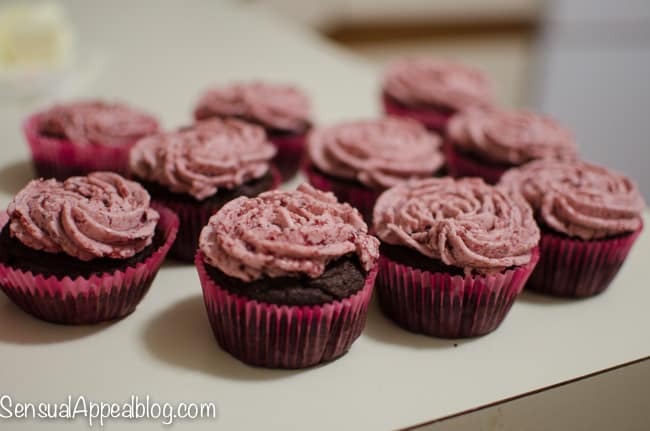 What are some of your own frosting piping tricks and tips? Do tell! These look fantastic! I love cherries and berries! Can’t choose 🙂 I did go strawberry picking this weekend though so I’ll be eating strawberries A LOT in the next week or so. Ohh those kind of strawberries are AMAZING! Don’t even compare to store-bought ones! 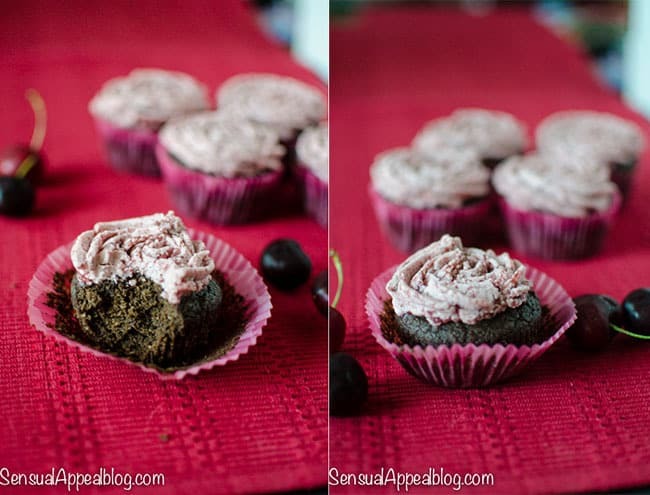 I’ve been wanting to make cupcakes recently but hesitate at how unhealthy the more traditional ones are… maybe I will give your vegan ones an attempt. I’m all for a more guilt-free indulgence! (Plus the fact that I’m trying to cut out dairy helps too). These look amazing. Cherries and chocolate are my favourite. I love berries and cherries… but cherries with chocolate win every time. My icing trick is the ghetto cut the tip off the baggie method. It’s messy, but it works! These look sinful and yummy! Just stopping by to welcome you to the Social Fabric Community! Those look so good!!! Welcome to Social Fabric! I love fresh cherries and berries when it is baked in something. Although I do love fresh berries too! Yum, they look so good! I am a big fan of cupcakes. I love cherries but I think I like berries even more!! And chocolate to either and I’m in!! Thanks for sharing at Saturday Dishes! We really appreciate it! Pinning.